Are you looking for a solution to track your competitors and ensure your business is successful, profit-making and competitive in the market? Keeping eyes on your competitors can be difficult. Are your price competitive? Are they running any great offers and promotions? ProWebScraping track competitive pricing data effectively and analyze market and internal business data to discover how market price events affect your company’s sales performance. We empower you to extract pricing data from any websites, monitor it and helps you to change pricing of your products accordingly to optimize profit margins and gain market share. 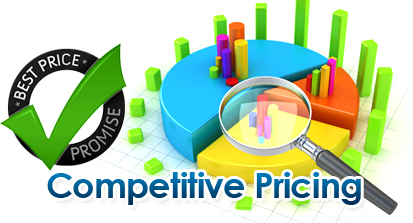 What Competitive and Pricing Intelligence Solutions ProWebScraping offer? ProWebScraping extracts, transforms, cleans and accurately compares your products with those of your competitors automatically. We provide 24x7x364 real-time monitoring of your competitors and their prices. ProWebScraping can also develop powerful web applications for data visualization with capabilities that helps you to to visualize the relevant data from every possible angle. It also helps you to identify pricing opportunities by product, category, department, and supplier, at any point in time and historically. The solution is capable of providing real time alerts of changes in competitor prices, promotions and inventory. You can view pricing history and trends. Monitor your performance with your competitors by combining and correlating competitive market data to sales, our solution enables you to focus only on the competitive pricing activity that really impacts your business performance. You can evaluate competitor product to find gaps and opportunities, and monitor changes. ProWebScraping can design and develop a customized solution for you specially considering your competitors, using automated data extraction technologies and human intelligence to collect, cleanse, and present analysis to assist you to aware on the competitive landscape confidently. Looking for building competitive and pricing intelligence solution? If you are interested in building competitive and pricing intelligence solution or have any price scraping and monitoring requirements that you want to get done, please feel free to contact us.